As promised the day started early, and even earlier for me. I was up at 5 am to try to utilize the slow demand for wifi so that I could get yesterday’s blog out. Best laid plans of mice and men!!! The young people that joined our hotel the day before started to come downstairs around 5:15….fortunately they were busy getting their bags organized and on their bus so I was able to publish by 5:30! We were all packed up and ready to board the bus by 6:15, then onto the pier where our bags were all checked, and our suitcases sealed… again, no non-endemic stuff is allowed from island to island …believe it or not, and ecosystems are quite different. There is absolutely no discarding of organic material ( apple cores, energy bar left overs, orange peels and seeds etc) as much as the finches and other life forms would like it, it is not healthy for their system, and at the equator, the growing conditions are perfect for almost anything to germinate. They are constantly trying to eradicate non endemic species as they encroach on the original species. We must be vigilant for our own behaviour and for that of others! Once we had our checks completed, we headed to the pier and waited for our taxi to take us to our boat for our crossing to our last island, Santa Cruz. 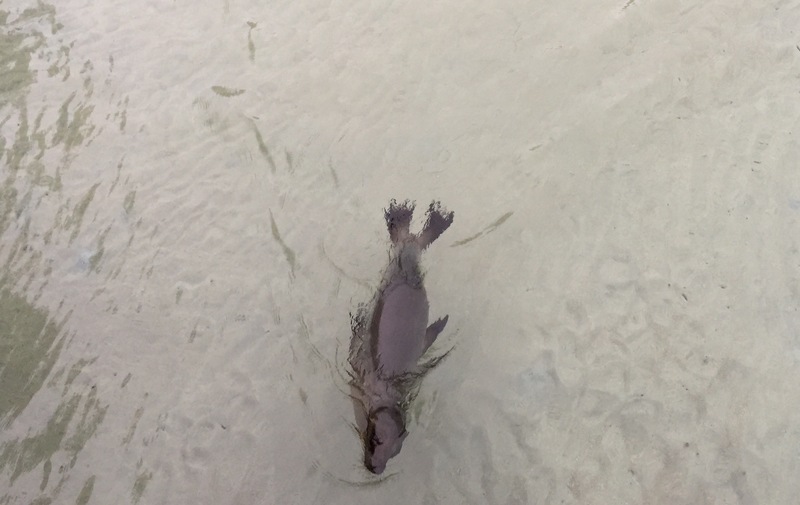 While we waited, we saw a couple fo baby seals playing by the shore, almost showing off for us! It was so cute! We all boarded the boat and began our journey…only about 2 hours to do the crossing. It was far less eventful with no one sick. The cruise was a good one, although it felt like we were close to airborne at one point…. I guess a big wave snuck up on the captain! All in all, we arrived safe and sound at Santa Cruz Island, and ogled at all the bigger cruise ships that were in harbor. We even saw the National Geographic ship! We arrived at the hotel at about 9 am. Too early for check in, but not too early for breakfast. We all enjoyed a lovely meal, and then we were off to the Charles Darwin Centre! En route to the centre we passed the fish market. 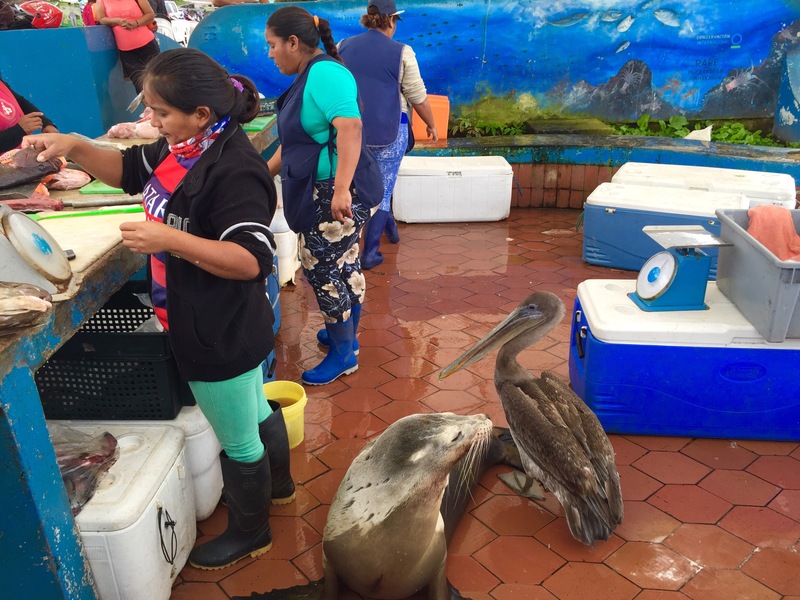 So much fun to see the fresh fish for sale, and the helpers that had gathered to assist the fish mongers with the clean up of the offal and waste. 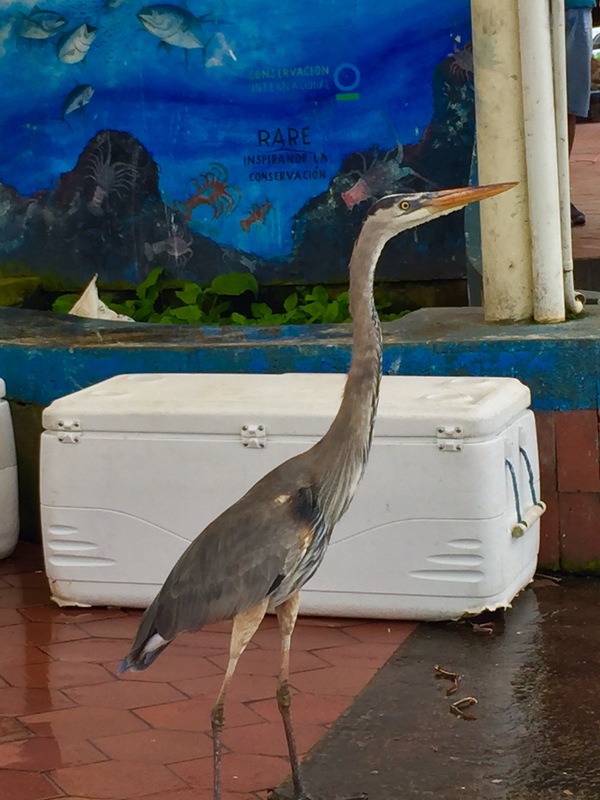 We could virtually walk up to a number of pelicans, a sea lion, a gorgeous heron, and at the breakwater beside the stall swam an eagle ray…all waiting for the inevitable treats! Sometimes the birds became so bold they would perch on the edge of the table where they were cleaning the fish! We were told that we could purchase a fresh lobster here, and take it across the road to be cooked at a local restaurant for our supper…pretty cool. We soon carried on to the Charles Darwin Centre. This centre focuses on the breeding of saddle back and dome back turtles. The saddle backs were near extinction with only about 10 females and one male left in the population. When the call went out for other males, the San Diego zoo responded, and “Diego” came to the centre. Well, he and the other male have been quite prolific with almost 2,000 progeny now representing their gene pools! We also saw the preserved body of “Lonesome Charlie”, a land tortoise and the last of his kind. Apparently when he died in 2012 at well over 100, his body was sent to the Museum of Natural History in New York to have his body preserved. He was retuned 2 years later and is kept under constant temperature and humidity in his own private building! After a few quick pics with Charles Darwin (statue) we were off to lunch! We ate on the “food street”, which is a block of outdoor restaurants on either side of the street. After lunch, we checked into our rooms and then did a fast turnaround to go back out to see some lava caves and a small sugar and coffee plantation. The lava cave was very interesting. As Santa Cruz is a younger Island that San Cristobal, these caves still exist. The lava formations are quite brittle and cave ins are common…in San Cristobal the lava caves have virtually all caved in! We were lucky on this particular visit as we spotted a barn owl roosting in a corner of the cave! Because this farm is mainly for tourists to see how production was done in the 19th century the owner also was quite tolerant in allowing many land tortoises to roam freely around the property. It was truly amazing to get up close and personal with these sometimes HUGE creatures! After we walked a bit of the property, we went on to the sugar cane and coffee part of the tour. Here we participated in the old fashioned pressing of the cane for juice. Once we had pressed enough juice, we went inside to try the juice on it’s own, and then with some lime…delicious. Finally, we were given a shot of “moonshine” made with the distilled juice. Not being aged, it was pretty raw! Next we saw how coffee beans were processed by hand and roasted and ground. Amazing and very labour intensive. Life as not easy for the early farmers! Soon it was time to head back to town. After a quick freshening up, Glenn, Gwen, Dan and I headed out for another great supper featuring a feast of seafood yet again! After supper we were told to head down to the pier to look for sea-life. The pier has spot light shining on the water which attracts plankton. This in turn attracts small fish, which in turn attract black finned sharks. It was truly amazing to see this feeding dance up close and personal! 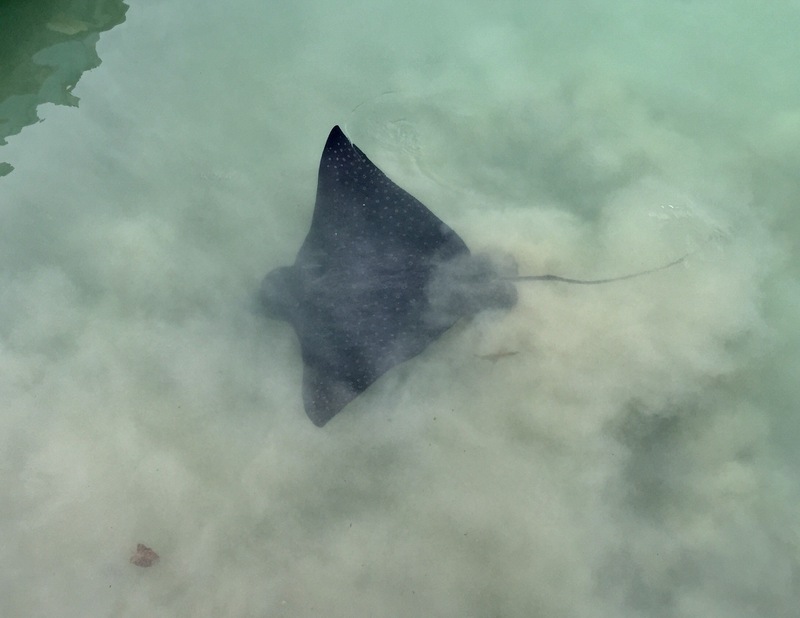 We even saw a giant eagle ray taking part in the festivities!! Well, it’s been another long day so it’s time to say Hast Mañana once again! Your blog brings back memories for me when I sailed through in 1999! I actually saw Lonesome Charlie! Stay safe! So cool! Was he in the Charles Darwin Centre? I was amazed to see the seal and pelican sitting so calmly by the workers. The pictures are beautiful. They are unbelievably tame. I guess that’s what happens when you treat humans as guests in the animal’s habitat! Wonderful to follow along with you. The pictures are brilliant – love that you get so close! I only cringed when you said 5am! eek… but the rest seems positively fascinating! It’s only a number, and you can go to bed early if you like! I’m looking forward to filling out the blog with more pics when I get better wifi!